JERUSALEM—Dalia Lamkus, a 26-year-old resident of Tekoa, and Almog Shiloni, 20, anIsrael Defense Forces soldier from Modi’in, were killed yesterday in separate terrorist attacks in Israel. Lamkus was stabbed to death by a Palestinian terrorist while waiting with others at a bus stop at the Gush Etzion junction in Israel, just next to the hitching station where Israeli teenagers Eyal Yifrah, Gilad Sha’ar and Naftali Frenkel were abducted this summer before being murdered by Palestinian Arabs. According to eyewitnesses, the attack occurred during the early-evening rush hour, when the terrorist unsuccessfully attempted to run down a group of people waiting at the stop, and then leapt from his car and began randomly stabbing. A 26-year-old man also stabbed was reported in moderate condition. A 50-year-old man who jumped from his car when he saw the attack and fought with the terrorist was injured as well. A guard on duty at the nearby Alon Shvut settlement, just southwest of Jerusalem, came running to the scene and shot the assailant, who was taken by ambulance to a hospital for treatment of his wounds. 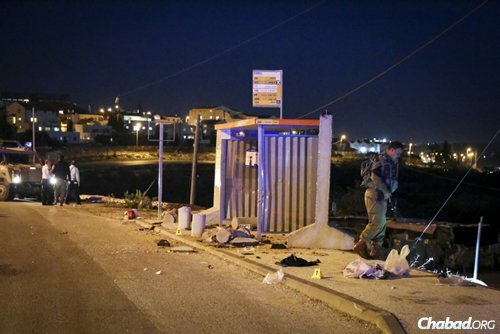 The killer was identified by police as Maher Hamdi al-Hashalmoun from Hebron. Affiliated with Islamic Jihad, he spent more than four years in Israeli prisons and was released five years ago, police said. The funeral for Lamkus is scheduled to take place on Tuesday at 10 a.m. in Tekoa, where the victim and her family have lived for the past 15 years. The attack in the West Bank came only hours after Shiloni was stabbed repeatedly by an 18-year-old Palestinian worker from Nablus at the Hahaganah train station in Tel Aviv. The young IDF soldier died following hours of surgery. The terrorist is among thousands of illegal Palestinian workers from the West Bank who travel into Israel daily for work. He is currently being treated at a hospital in Israel. A Jewish high school student wearing a kipah was attacked by a mob of 15 young men outside a private high school near the Bastille in Paris, according to the National Bureau for Vigilance against Anti-Semitism, or BNVCA, a French association. He received medical attention at the scene. In an unrelated incident in the middle of the night, vandals hurled stones at the glass doors and set off a firebomb at the popular Zekai kosher sushi restaurant in an upscale neighborhood near the Arc de Triomphe, according to a report in the Tribune Juive newspaper’s web site.